Example of one of my art student’s work for the month. Each month they work on a different project showcasing a new skill. A great way to make money at home like the awesome Proverbs 31 woman…..even while homeschooling….is to teach a class to other homeschoolers! Personally, I am not very good at academic subjects, because I really didn’t like school the first time around, but I have grown to love learning as I teach my children. However, learning to like it and teaching it are two different things. You must chose something that your really good at…….loving it is just a bonus. 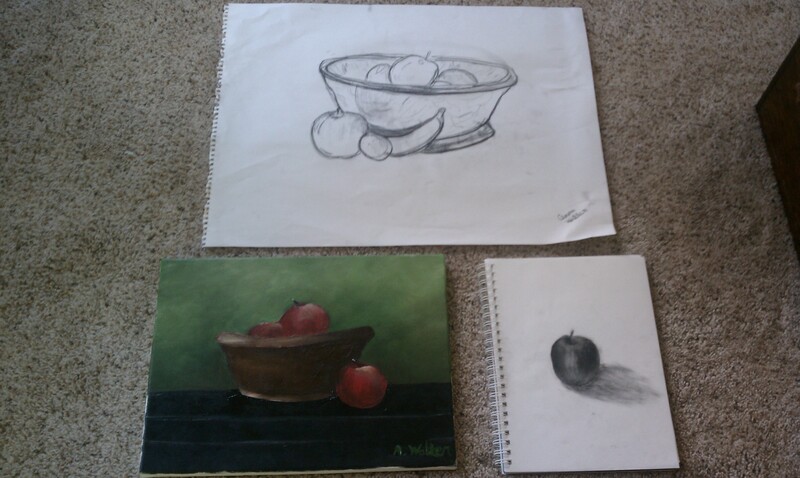 I chose art classes, because it was a natural choice. I owned a mural company, I am an artist, I love kids, and I love teaching. Win-win situation. Because I chose something that comes easy for me, it is not at all stressful. If I had chosen math, then not only would I have been a basket case, but the parents would probably have me arrested for ruining their children’s minds with my horrible math skills. Not a good scenario, right? So, the key here, is to pick something that you can teach with your eyes closed. Another way to be frugal like our Proverbs 31 mentor, is to swap services. Why pay for a class for your kids, when you can simply switch kids with someone, and each mother teaches what she knows best? I have a friend who thinks English is an ‘art’ form (you know, Language Arts), but I think she’s crazy. To me, art is art, and language has nothing to do with it. So, she taught my children English with Rod and Staff (which makes my eyes cross, but it is one of the best curriculum’s out there), and I taught her kids art….real art :-). No money exchanged hands (can’t get more frugal than that), and all of our kids benefited. 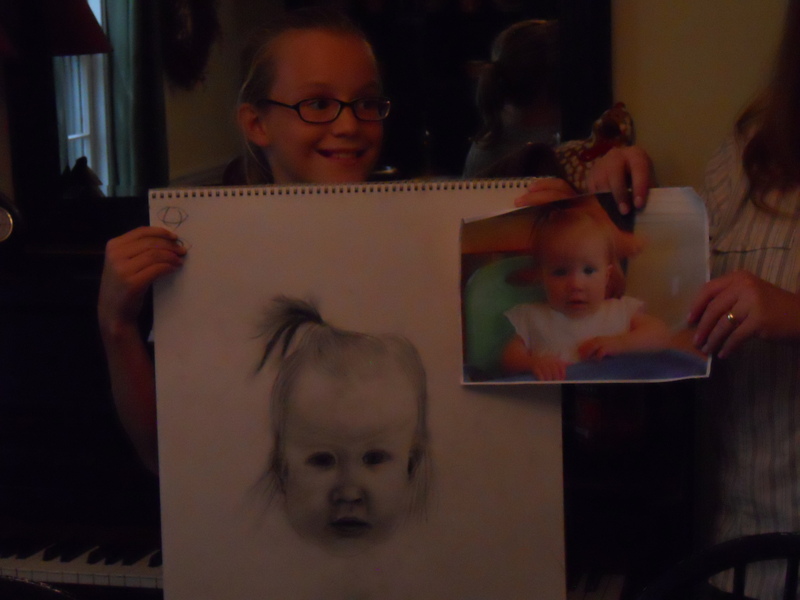 One of my sweet students…..whom is very talented. Classes will be held every Wednesday and Thursday, unless noted. OLDER STUDENTS (AGE 10 AND UP) OR YOUNGER STUDENTS WHO HAVE AN ADVANCED NATURAL TALENT: Wednesdays: 10:00 a.m. to 11:30 a.m. OR 3:30 p.m. to 5:00 p.m. YOUNGER STUDENTS (AGE 6 TO 10) OR STUDENTS WHO WANT TO LEARN TO DRAW, OF ANY AGE 6-18: Thursdays: 10:00 a.m. to 11:30 a.m. OR 12:30 p.m. to 2:00 p.m. Registration: A one time per student registration of $20.00 must be paid before signing up for classes. OLDER STUDENT Cost: $80.00 per month, paid in advance on the last class of the previous month. Only 4 students are accepted in each class. YOUNGER STUDENT Cost: $50.00 per month, paid in advance on the last class of the previous month. Only 6 students are accepted in each class. learn scale and line, and still life painting. 3. Learn shading techniques, still life painting. 4. Learn composition, perspective, abstract painting. 5. Color value painting, abstract painting. 7. Cartooning, cartoon shading, large scale painting. 9. Color tones for portraits, portrait composition, learn basics of portrait composition. 11. Landscape composition, undertones, highlighting, learn basics of landscape painting. ***Classes are geared toward the student, not the agenda. With only four students, each class is designed for customized instruction. YOUNGER STUDENTS (OR OLDER STUDENTS WHO WISH TO LEARN TO DRAW): These students need no experience or skill set. The only requirement is a desire to learn. This is NOT an arts and crafts class. These classes are the exact same as the older students. I believe in mastering skills early on so that new and more exciting skills can be steadily acquired. 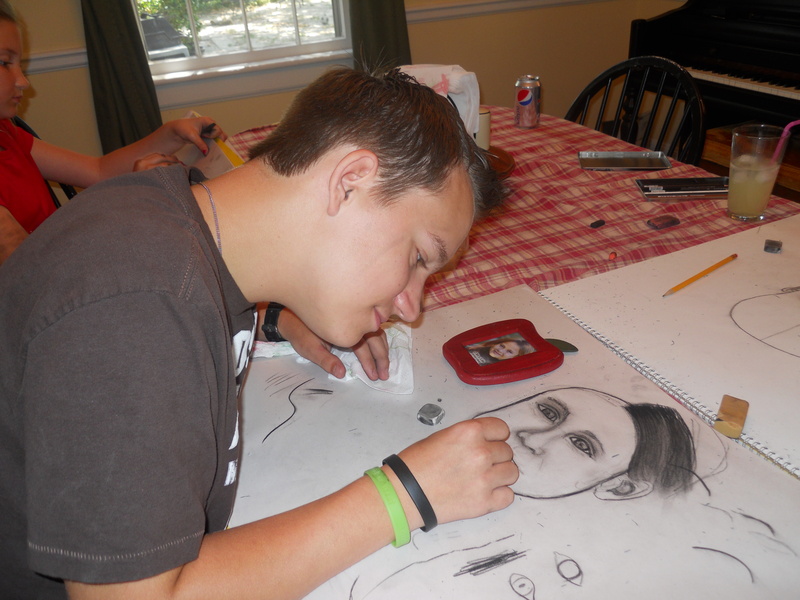 All skills will be taught in a slower pace designed to make learning art fun. And fun we do have! Please email me at blah blah blah, if you have any questions. Registration is required before classes may be attended. Classes will begin Wednesday, October 3rd or Thursday, October 4th. Having a full portfolio of my own work, helps the parents to see my worth as a teacher. 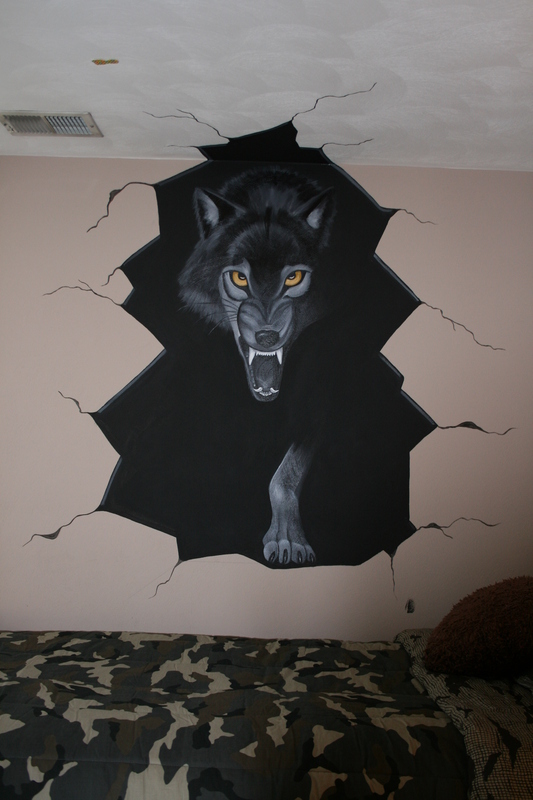 Here is a mural that I painted, while I owned my own painting company. 3. PRICE: Ok, I know that this one can be pretty tricky. You don’t want to charge too much, but you also don’t want to charge too little. As you can see from above, my younger students pay $50 per month, and my older students pay $80 per month. If this sound high, remember that my classes are 1 and 1/2 hours long, they are NOT craft classes, the class sizes are very low (which enables me to give more one-on-one time), and they will be completing (1) project per month at a High School/College level. It also doesn’t hurt that there are not very many Fine Art classes out there…….one’s that do not teach ‘crafty’ art. If you have a standard class, like math or English, you can feel comfortable charging $30 to $45 per month, depending on levels (lower grades or advanced). If you have a specialty class, like IEW’s High School Essay writing (Institute for Excellence in Writing) or a musical class, like the banjo, then you can charge more…..anywhere from $50 to $90 per month. Just remember, if you are charging a lower price, then lower your class time to half an hour or forty-five minutes. If you are charging a higher price, throw in the materials or offer longer classes (like mine at an hour and a half). If you just can’t decide what you should charge, then research classes similar to what you plan to offer, and see what they are going for. You can either charge the same, charge the same and offer something extra, or charge a little lower until you get a full house. Charge a registration fee. I usually charge a one-time fee of $20 per child. This fee offsets the price of the ink that it takes to run off copies of registration forms, worksheets, instructions, etc. It also offsets ‘forgotten items’. A squirt of paint does not cost very much…..but 50 squirts does! Children are always going to forget supplies, so charging a registration fee keeps me from having to chase after parents for extra money. Request class payment one month in advance, then you never have to worry about being paid for your work. Don’t count your chickens, as the story goes. I have tons of interest each month, loads of people who email me about my classes, and only 16 students. Just because someone is ‘so excited’ and will ‘come with a check tomorrow’, doesn’t mean that they will. Do not count on this ‘class money’ until the money is in hand. I have been burned numerous times….all of which is my fault for spending the money in my head before the student actually arrives with payment. I have never had a student quit without advance notice, but I have heard tales of it happening. So just be cautious. One final thought on price. 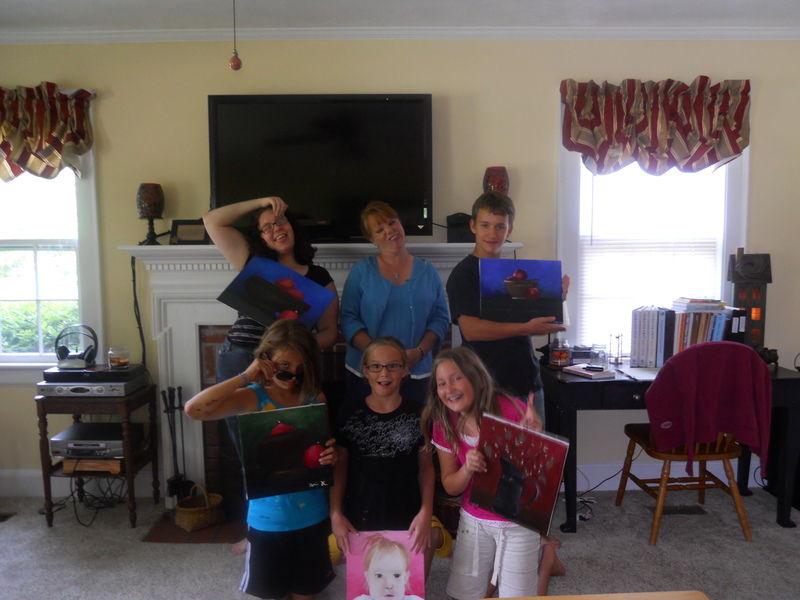 I love teaching art to kids who truly want to learn. Because of this, if I know that price is holding a parent back from letting their child attend my classes, I will try to work something out. Either swapping services, anything from babysitting to teaching my kids something, or offering a lower cost lesson for half the time. Just let God guide you on each individual situation. Just like owning a business….you must advertise and sell your talents. 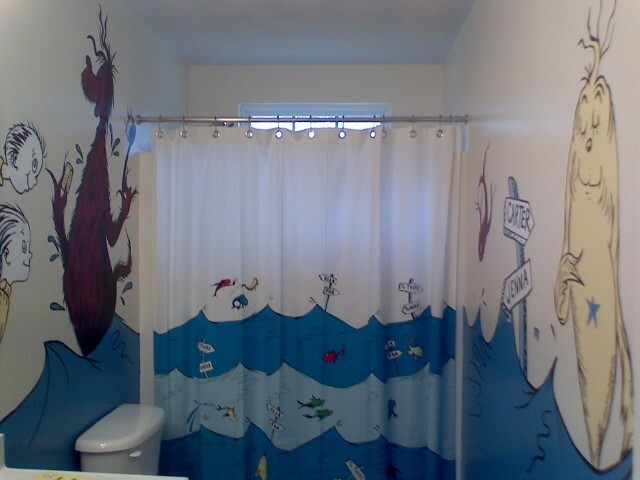 Here is a bathroom that I was commissioned to paint. Church, Yahoo Groups, Google Groups, Co-Ops, email lists, field trip groups, friends, family, craigslist (BE CAREFUL! ), etc. You can also ask to display a flier of your classes in homeschool stores, book stores that cater to homeschoolers, other churches that offer homeschool activities, and schools that your children already attend (like a dance school or music school). 5. ORGANIZE YOUR CLASSROOM: If you will be teaching out of your home, then designate a space just for that. It does not have to be a room just for teaching. I teach in my dining room, however, I have shelves dedicated to all of our art supplies. My students know where they are and they are free to borrow from my supplies (easel’s, paints, brushes, rags, etc.) I also have a shelf dedicated to ‘class set-up’. This includes vinyl tablecloths, drop cloths, water jugs, etc. Just get organized to minimize set-up/break-down time, and maximize teaching time. If you are teaching in a church classroom, or some other place away from home, then make up portable ‘tubs’. I could never tote all my art goodies….there’s just too much. However, if you are teaching Home Economics, then you could make up a ‘sewing tub’ and ‘cooking tub’ and a ‘administration tub’ (registration forms, receipt books, worksheets, etc.). A ‘tub’ is a large, covered, plastic tote, that you can get at Wal-mart for $9 bucks. Throw in all of your supplies, put them in your car, and you will always be ready for your class. The worst feeling in the world, is getting to your class location, and realizing that you are ill-prepared. Get Organized! Registration Forms (just request the basic information: Child’s name, parent’s name, address, phone numbers (GET PARENT’S CELL NUMBERS!! ), allergies, medical problems that you would need to know about, age, grade, etc. Phone Tree: This is for parents who would like to carpool. You could pass these sheets out and have everyone fill out their name, number, and address. That way, if there are families that live close to each other, they can work out arrangements. My son takes my class as well. Don’t be money driven….I only teach four students per class, and my son takes one of those spots. However, missing that one tuition is nothing compared to the joy of teaching my own. 7. PRACTICE DILIGENCE: This is a big one for me. If I have a class at 3:30 p.m…….then I have a class at 3:30 p.m. Sure, I have had something come up before, but it is usually a pretty bad bug going through my house, or an emergency (a real one, not that I don’t feel like teaching). Don’t let your kids down, and don’t let your budget down. Require that your students be on time…..and if they are more than 10 minutes late twice, they will not be let into a future class if they are late (that means if you get there 15 minutes late, you will not come into my class for that week, and you will not receive a refund). I do not have a problem with late students, because of this rule. This also means that you, the teacher, cannot be late. My daughter’s dance teacher is ALWAYS late. Because of this, most of her students are late as well. This bugs me. My time is valuable, and I extend that value to my children’s time as well…..so just be considerate. Me and some of my students. Being crazy and fun are requirements if you want to attend my class! 8. HAVE FUN: Enjoy the freedom that you have been blessed with to homeschool your children….by God, by our husbands whom support us, and by our country who fought for our freedom. The Proverbs 31 woman found several ways to help out her family’s budget….and now you can to. Just don’t forget to have fun while doing it!